Creative Company collaborated with the McMinnville Economic Development Partnership to rebrand the organization and redesign their website around their messaging and positioning. The new economic development brand identity puts the focus on McMinnville and Partnership. The website, built-in cooperation with McMinnville-based LVSYS, transforms how McMinnville is presented to local, regional and out-state businesses that want to locate, start or expand their business, or hire a workforce in McMinnville. The logo design establishes an economic development brand that is both business-like and friendly. 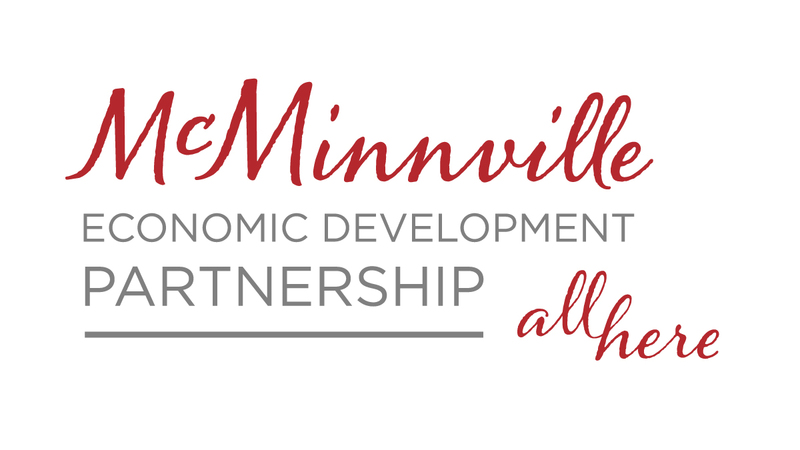 By putting the emphasis on “McMinnville” with a calligraphic font, the logo communicates both the personal touch and the group’s focus on McMinnville. Supporting the script is a classic sans-serif font with an emphasis on partnership. The goal for the Partnership was to create a website that provides deep information about services available to businesses, while showcasing McMinnville companies, lifestyle and resources. A simple, open design with clear calls to action and large text makes the site welcoming and very easy to read. The LVSYS platform supports in-house updates and content additions by MEDP staff. Creative Company built content from the messaging hierarchy created in 2011 for MEDP. The website was organized around the four key categories of information visitors are likely to be searching for: Locate, Start, Expand, Hire. Details about McMinnville and the region were summarized around the messages “Exceptional performance” and “Enviable lifestyle.” Pages are supported with testimonials and photos that introduce case studies. Links to important information are easy to see and scan as a grid of badges. “MEDP is a true champion for all things McMinnville. As the one call for anyone who wants to do business in Mac, Jody Christensen, with her infectious enthusiasm and exceptional network of resources, has kept local businesses here and cultivated new business for our town. We’re thrilled to provide a brand, messaging and an effective website that support her staunch advocacy for all that Mac has to offer,” commented Jennifer Larsen Morrow, Creative Company’s president and creative lead on the project. “I also want to thank Peter Kotenko, our graphic designer, whose vision was brought online by the team at LVSYS. Heather Simpson, marketing specialist at MEDP, took on the monumental job of building out the pages and content for the site. Great job, everyone!” Morrow added. In September, the website was chosen as one of the top 10 economic development websites of 2015, by Accrinet.